A man has been jailed for nine years for biting off a man's cheek in an Oxford nightclub. CCTV images released by police showed Keenan Samuelson, 27, of Tyne Road, Abingdon, apparently grabbing the 38-year-old victim by the throat and repeatedly biting him. The attack occurred at The Bridge club on Hythe Bridge Street in the early hours of Saturday 8 April, 2017. 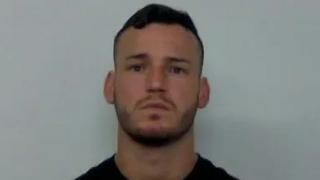 Samuelson was sentenced at Oxford Crown Court on Friday. A jury found him guilty of one count of wounding, following a two-day trial. The victim was left with "the worst injury I have ever seen in my career," Det Con James Macaro said. Samuelson attacked the victim after two men accidentally knocked into each other on the dancefloor. He then poured a drink over the victim before tearing off "a large portion of the victim's cheek," police said. The victim required surgery after the attack and "will be scarred for life".